In 2018, Androgyny is very much ‘in’. The prevalence of clothing that refuses to conform to gender stereotypes is ever-growing, and so is the freedom to wear it. With high street brands including John Lewis and H&M contributing to the growth of unisex trends and wares, it is easy to forget the astounding significance of this concept. For women in particular, constricts of gender and social class have historically been the defining factor in the garments we are able to wear. In fact, it is only within the last hundred years that matters of comfort or personal expression have been given precedence. Even the option of sporting the humble trouser is a relatively new concept for anyone who does not identify as male, and whether the choice is good or woefully bad (I’m having flashbacks to a pair of cargo trousers in pink camouflage) it is a powerful nod to the women who provided us with that choice. Marlene Dietrich was one such woman. A German actress and singer, Dietrich found fame amid the so-called ‘golden years’ of Hollywood, and was known as Germany’s answer to Greta Garbo. She was a woman of continual reinvention; rumoured to have had a number of affairs with both men and women, and famously referred to the closeted gay and bisexual women in Hollywood as a Sewing Circle. Clearly, Dietrich was not a woman prepared to conform. Seemingly indifferent to the prevailing expectations surrounding gender and sexuality, Marlene Dietrich stood alone in her dissent; leading a life that was as scandalous as it was glamorous. And she did so wearing a pair of trousers. 1930: less than a year after the devastation of the Wall Street Crash, and amid a world craving relief from the mundanity of the resulting economic crisis, Josef von Sternberg’s film Morocco was released. It is a tale of romance, with a touch of cabaret and scandal for good measure. Marlene Dietrich was the film’s lead actress, and her portrayal of character Amy Jolly would earn Dietrich her only Oscar nomination. Despite this, the film is best known for one very significant scene – a scene in which Dietrich appears wearing a men’s tuxedo. Incredibly, this was the first time any female in a major motion picture had adopted an ensemble intrinsically viewed as masculine, and it encouraged feverish conversation about the concept of gender within fashion - a conversation that would inspire other women to (literally) follow suit. The effect, of course, was not immediate. There were not parties in the street, ritual burnings of skirts, or a sudden influx of oh-so-comfy culottes. Women had worn trousers before. They had not, however, worn trousers like this. Before Dietrich, trousers had been purely functional, and associated with a very limited range of activities. They were considered inherently masculine - entirely utilitarian. They were certainly not the basis for fashionable evening wear. Yet, in one short scene, and with a very nonchalant tip of her top hat, Marlene Dietrich turned this belief on its head. Hollywood in 1930 was a visual manifestation of the lives viewers wished they led; a dream of characters they wanted to be, and outfits they wanted to wear, all neatly packaged and sold to the masses on the big screen. Marlene Dietrich simply provided something else to aspire to - and women took note. A mere three years later, an article appeared in The Chicago Daily Tribune with the headline “Chicago Girls Copy Marlene.” Female mannequins in department stores were spotted wearing trousers for the first time, and Dietrich had been comically dubbed “the best-dressed man in Hollywood.” Marlene Dietrich had not only challenged the concept of gender within fashion; she had been instrumental in galvanising its change; and all an impressive thirty years before the sensation that was Yves Saint Laurent’s Le Smoking. Despite Dietrich’s best efforts, it would be decades before trousers were accepted completely into mainstream female fashion. Dietrich was considered an eccentric Hollywood star, and her trousers largely part of her trademark. 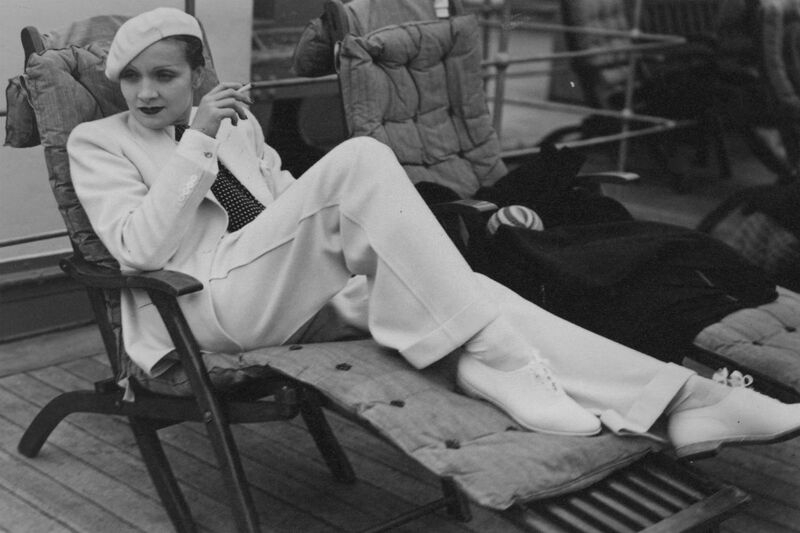 It would be an exaggeration to suggest that Marlene Dietrich was the lone reason for the eventual acceptance of the trouser on and by women, but that does not mean she was not hugely significant in their adoption. In the face of controversy, and amid incredible societal restriction, Marlene Dietrich was a woman who took a decidedly two-legged stand. With her influence, trousers suddenly became an option for women, and an option dripping in glamour and allure. Marlene Dietrich represents a very strong thread in the history of female fashion; one based on rebellion, and a good old-fashioned middle finger to conformity. It is a thread that runs through the very fabric of the trousers we wear today. Even if they are made in ghastly pink camo.